Within the last couple of days, Oregon’s coaching staff has been on high alert in terms of recruiting players that they believe will be important to their team down the road. As the Ducks have recruited some outstanding high school standouts, three emerge as the most critical to the success of the football program. Here’s a fun fact: DE Kaumatule went to the same high school as Defensive Lineman Deforest Buckner. Plus, Buckner was the key figure who convinced the five-star standout to spend his collegiate football years at Oregon. This 6-foot-6, 280-pound behemoth has recorded a total of 25 tackles, 18 of which were done by him alone. Kaumatule presents a serious threat to any team as he has the remarkable ability to rush up the gap and force the QB to hurry and make an ill-advised pass. It’s going to be exciting to see the impact Kaumatule will bring to the Ducks on the defensive side of the field since Oregon has lost many defensive veterans to the NFL draft. 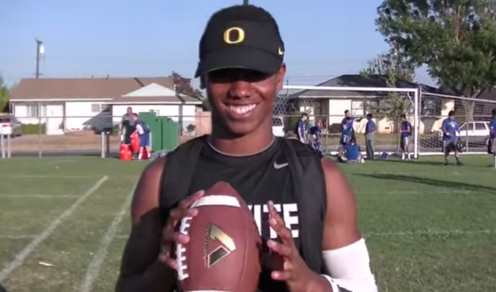 Does Waller have what it takes to be the next Oregon QB? Let’s be honest here, living up to the hype of what Marcus Mariota accomplished with the Ducks is not an easy task. However, one unique dual-threat QB by the name of Travis Waller seems to be ready to take on this daunting task. Despite the fact that Waller will be competing for the quarterback position against other fellow Ducks, he has stated that his ultimate goal is to win the starting position. In his last two seasons at Servite High School in Anaheim, CA, Waller has thrown for a total of 3361 yards and has scored 26 touchdowns, with only 13 interceptions. Although these are not “Mariota-like” numbers, they are solid stats that demonstrate true potential going into the future. The interesting story about Griffin is how he chose Oregon above schools such as Alabama, Florida State and Ohio State all of which have made a big name for themselves in college football history. Although this running back suffered a season-ending knee injury during his senior year in high school, Griffin has already provided a great glimpse of what kind of player he can be in Oregon’s dynamic offensive system. During his season opener this past fall, the dazzling RB rushed for three amazing touchdowns that exemplified a similar speed and skill set to previous Ducks such as LaMichael James and De’Anthony Thomas.